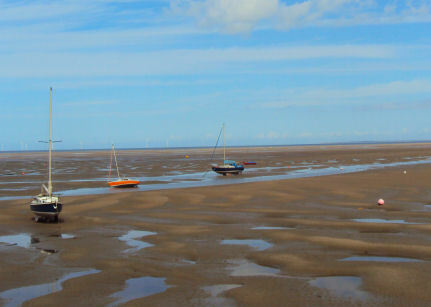 The village of Meols is situated on the northern coast of the Wirral Peninsula near Hoylake and faces the Irish Sea. Meols is an amalgamation of two former villages "Great Meols" and "Little Meols". the name derives from the Old Norse word 'melr' meaning 'sand dunes'. In 902 A.D. the Norwegian Vikings were expelled from Dublin. Norse settlers, led by their chief, Hingamund, left Ireland for the English coast. Ethelfleda, Lady of the Mercians, the daughter of the Anglo-Saxon king, Alfred the Great, allowed them to settle in the north of the Wirral. Meols was mentioned as 'melas' in the Domesday Survey. 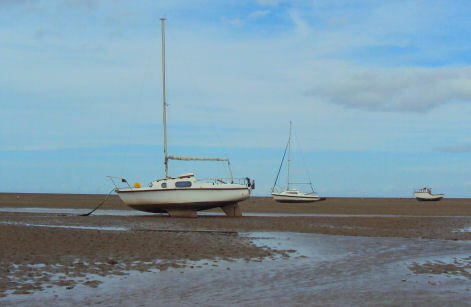 Meols beach consists of a vast sandy beach exposed at low tide, at high tide there is a small strip of shingle. The beach was ‘recommended’ in the Marine Conservation Society's 2012 Good Beach Guide, the guide’s highest accolade. 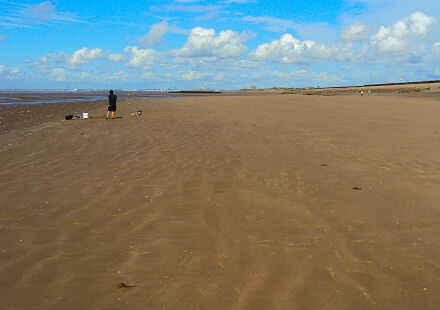 The views from the beach are excellent, Formby Point, Southport and Blackpool can be seen in the distance and on very clear days it is possible to see the southern mountains of the Lake District. An ancient settlement, Meols originated as a port some 2,400 years ago. Trade with France and possibly the Mediterranean, occurred even before the Roman era, and evidence of a Viking beach market has been discovered. Impressive archaeological finds suggest that Meols was an important centre in antiquity. In 1846 the Reverand Abraham Hume, while making a visit to the parsonage in nearby Hoylake, noticed some ancient artefacts, including a Roman brooch which was displayed on the mantelpiece. He was informed that local fishermen had discovered them on the beach at Meols. Realising the importance of the finds, he made efforts to recover further objects. Items found on the shore range from the Neolithic period through to the eighteenth century and include Roman, Saxon, Viking and medieval artefacts. 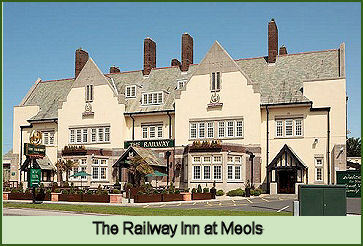 Today, Meols is a mainly residential village with a small yacht and fishing community on its Irish Sea shore line. There is a local community park and a bowling green. In October 1991 a local man, John McRae, visited the Viking exhibition at Liverpool Museum and later wrote to them about his father’s discovery of a boat during construction of the new Railway Inn at Meols in 1938. During the work on the inn, a section of the boat had been revealed but he had been ordered by the site foreman to rebury it. He did however, make careful notes. The son's letter to the museum described where the boat lay, about 10 feet below the ground surface of the Railway Inn. A section five to six feet long of a 3 feet wide boat had been exposed. Professor Stephen Harding of the University of Nottingham, an expert on the Merseyside Vikings, detected the outline of the vessel under the pub car park using state-of-the-art ground radar technology. He believes it is either a Viking transport boat, similar to a longship, or a ship from the centuries that immediately followed the Viking era. It has overlapping planks, typical of Viking "clinker" boats. Whilst Viking boat burial sites have been unearthed in Britain before, the wooden vessels have always been rotted away, leaving only their more durable contents. But the Wirral boat is preserved in waterlogged blue clay, and thought to be almost completely intact. Professor Harding is now applying for European funding to carry out excavations of the site, believes the ship could be carefully removed and exhibited in a museum. West Kirby stands on the estuary of the River Dee at the northwest corner of the coast of the Wirral Peninsula. The name West Kirby is of Viking origin, originally Kirkjubyr, meaning 'village with a church'. The town was mentioned in the Domesday Book. Thurstaston Common a popular spot with walkers for the superb views, at just 90m above sea level, it offers some of the best the Wirral has to offer, from the summit of Thurstaston Hill the views encompass the Dee Estuary and the hills of Wales.